For suits that already have built-in arm restraint rings. Designed to keep the drivers arms and hands inside the car in the event of an accident or rollover. They will not hinder movement and are adjustable to to provide freedom of movement. 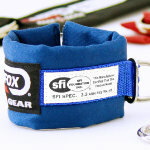 1-inch Premium quality heavy-duty soft polyester webbing. Adjustable from 11 inches to 16 inches. Hardware is crafted with military grade AISI 503 specification steel. All tether parts have been SFI tested and certified. Click for complete Arm Restraint sets. Sets include tethers and arm bands.